A New Digital Art Museum In Paris - What The Heck Is That? In a city dedicated to beauty, style, and magnificent art, the arrival of a new kind of museum is sure to attract people, even the ones who would never set foot inside a traditional museum - they will go and see this one. The concept is not new in France, a majestic cave in Provence has had digital shows for years, and the sheer splendor of the location has much to do with the exhilarating novelty of the viewing - as the Carrières des Lumières is located inside an old limestone quarry in a tiny village of France. The gigantic tall walls of white stone are covered with vibrant images of such artists’ works as Matisse, Chagall and others. The grandiose view of such masterful paintings makes is almost overwhelming to walk the caves. The multiple cavernous rooms stay at a very cool temperature, no matter the outside heat. From the outside, there is nothing to see. It’s all in the belly of the rock. A parking lot in front allows visitors to walk to the entrance and be visually kidnapped as soon as they enter the series of huge grottos. 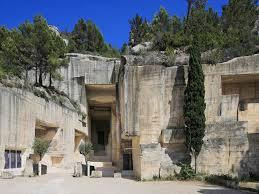 Do not miss the visit if you travel through Provence, it’s at the entrance of a historical rock village, worth a visit itself, Les Baux de Provence is a tiny commune a stone-throw away from my family house in Saint-Rémy de Provence, on the other side of the Alpilles chain. We go every summer to visit the art in the caves, and never cease to wonder in front of the displays. The village itself is one of our nice lunch destination, at a terrace restaurant hanging over the steep rocky face of the road. The village itself is suspended on a rocky outcrop crowned by a ruined castle and has only barely 450 residents, but over 1.5 million visitors each year. 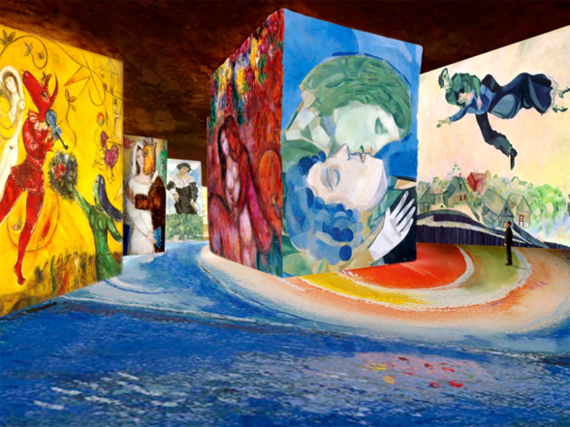 The Parisian project will follow the concept of the Carrières de Lumières, which has displayed in the past five years, since opening, the masterful works of Gauguin, Van Gogh, Monet, Renoir, Chagall, Klimt, Michelangelo, Leonardo da Vinci, and Raphael. Replicating this in Paris will probably be a challenge. No caves there. But the digital viewing of great works of art is indeed a new and imaginative way to look at paintings and other forms of artistic expressions. Even for people who do not appreciate gazing at frames for hours, this is a different way to learn and watch paintings. Children will most likely adore it. The first of its kind in the French capital, the museum is set to open in 2017 sometimes, in the 11th arrondissement of the city. 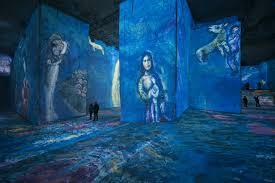 L’Atelier des Lumières, as it will be named, will be dedicated to immersive art exhibitions. Created by CultureSpaces and using innovative projection technology paired with original musical scores, the exhibits will showcase some of the most famous names in art history. Sawyer, Sidonie. "A New Digital Art Museum In Paris - What The Heck Is That?" The Huffington Post. Accessed September 13, 2016. http://www.huffingtonpost.com/sidonie-sawyer/a-new-digital-art-museum_b_11966878.html.